Anyone who has read the Hungry Caterpillar knows what a popular classic this is. Well this annual brings the story (and that of the Very Lonely Firefly too) to life. Children can add stickers to each page of the book as they read, as well as colouring and counting pages at the back making it great fun and educational too. My little girl and I read the book every night over a couple of weeks and each night she added stickers to one of the pages. I hadn’t read the Very Lonely Firefly story before but think it’s great! 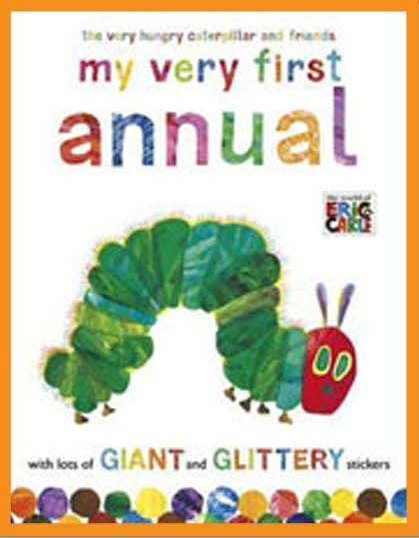 I can recommend this annual to any parents, it will keep your little ones entertained for hours. We have this one too, my five year old has been putting in the stickers and loves it too so wide age appeal!